(courtesy of the BBC Website). The important places are 15 and 16, obviously. The natural order of things has been restored…. 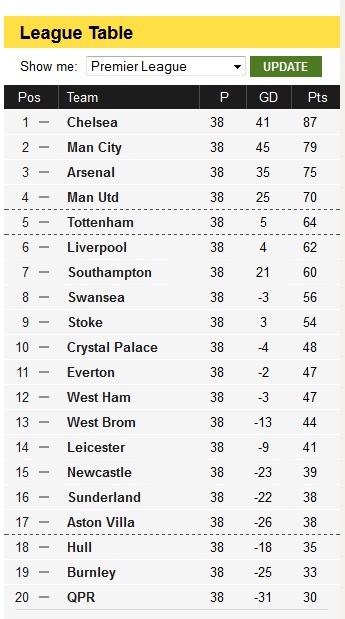 Another League Table came out over the Bank Holiday. This was the annual Guardian University Guide. I’m deeply sceptical of the value of these league tables, but there’s no question that they’re very important to potential students so we have to take them seriously. This year was pretty good for Sussex as far as the Guardian Table is concerned: the University of Sussex rose to 19th place overall and the two departments of the School of Mathematical and Physical Sciences both improved: Physics & Astronomy is back in the top 10 (at number 9, up from 11th place last year) and Mathematics rose 22 places to take 21st place. Gratifyingly, both finished well above Sunderland. While these results are good news in themselves, at least around my neck of the woods, as they will probably lead to increased applications to Sussex from students next year, it is important to look behind the simplistic narrative of “improvements”. Since last year there have been several substantial changes to the Guardian’s methodology. The weighting given to “spend-per-student” has been reduced from 15% to 10% of the overall score and the method of calculating “value added” has excluded specific predictions based on “non-tariff” students (i.e. those without UK entry qualifications, especially A-levels). What the Guardian consistently fails to do is explain the relative size of the effect of arbitrary methodological changes on its tables compared to actual changes in, e.g., cash spent per student. Imagine the outrage there would be if football teams were not told until the end of a Premier League season how many points would be awarded for a win…. This entry was posted on May 26, 2015 at 12:53 pm and is filed under Education, Football with tags Football, Guardian League Tables, mathematics, Newcastle United, Physics & Astronomy, Premier League, Premiership, University of Sussex. You can follow any responses to this entry through the RSS 2.0 feed. You can leave a response, or trackback from your own site.